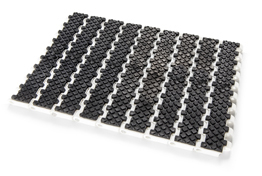 MD series’ modular belts have a pitch of 12.7mm allowing a nose bar diameter of 20mm to be achieved. The polygonal effect is consequently reduced which results in less vibration and improves the stability of small products being conveyed. 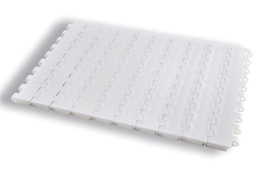 Modular belts with low friction upper face (LF type) facilitate accumulation and release of products. 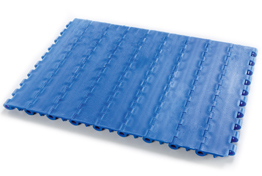 HP series modular belts have a high traction force and reduced vibration during operation. HP series modular belts are particularly suited to long center distances, and applications which require a high resistance to impact. 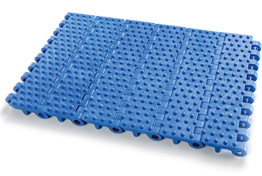 The “GT” modular belts have rubber-top modules on the upper face, which allows the conveyance of product on inclined or declined applications. 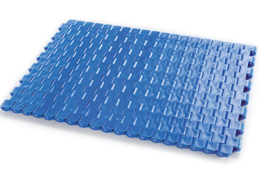 EC series’ modular belts feature a smooth upper face which facilitate easy cleaning. EC series’ modular belts are particularly suited to food-processing applications, where the highest levels of hygiene are vital. 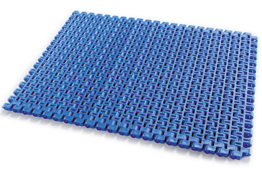 EC Series modular belts have a high traction force and good resistance to impact.